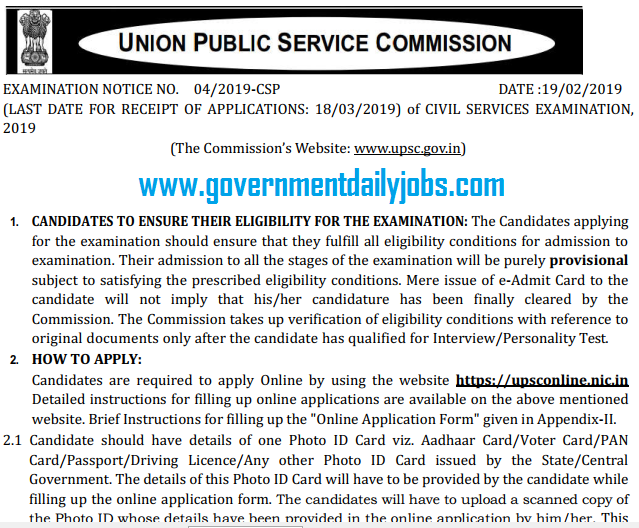 NOTIFICATION: Union Public Service Commission (UPSC) New Delhi inviting online applications for filling up 896 Group “A & B” vacant posts of Indian Administrative Service (IAS), Indian Foreign Service (IFS), Indian Police Service (IPS) and other Central Services through Civil Services Examination, 2019 (CSP 2019) from eligible and interested willing candidates. It is latest & good information for unemployed personnel those who are looking for these new Jobs in Government sector & other organizations. Job seekers, who wish to apply for these vacancies regarding UPSC Civil Service Exam Recruitment 2019, must have passed a Degree of any of Universities incorporated by an Act of the Central or State Legislature in India or other educational institutions established by an Act of Parliament or declared to be deemed as a University Under Section-3 of the University Grants Commission Act, 1956, or possess an equivalent qualification with a required experience if asked. Applicant’s upper age should be as per Govt. rules and age relaxation is applicable to all reserved category candidates i.e.SC/ST/OBC/PWH /Women candidates etc. PLACE OF WORK: All India. NO. OF POSTS: 896 vacant Group “A & B” posts of Indian Administrative Service (IAS), Indian Foreign Service (IFS), Indian Police Service (IPS) and other Central Services through Civil Services Examination, 2019 (CSE 2019) through UPSC. (1) Indian Administrative Service (IAS). (2) Indian Foreign Service (IFS). (3) Indian Police Service (IPS). (4) Indian P & T Accounts & Finance Service, Group ‘A’. (5) Indian Audit and Accounts Service, Group ‘A’. (6) Indian Revenue Service (Customs and Central Excise), Group ‘A’. (7) Indian Defence Accounts Service, Group ‘A’. (8) Indian Revenue Service (I.T. ), Group ‘A’. (9) Indian Ordnance Factories Service, Group ‘A’ (Assistant Works Manager, Administration). (10) Indian Postal Service, Group ‘A’. (11) Indian Civil Accounts Service, Group ‘A’. (12) Indian Railway Traffic Service, Group ‘A’. (13) Indian Railway Accounts Service, Group 'A'. (14) Indian Railway Personnel Service, Group ‘A’. (16) Indian Defence Estates Service, Group ‘A’. (17) Indian Information Service (Junior Grade), Group ‘A’. (18) Indian Trade Service, Group 'A'. (19) Indian Corporate Law Service, Group ‘A’. (20) Armed Forces Headquarters Civil Service, Group ‘B’ (Section Officer’s Grade). (21) Delhi/Andaman & Nicobar Islands/Lakshadweep/Daman & Diu and Dadra & Nagar Haveli Civil Service, Group 'B'. (22) Delhi/Andaman & Nicobar Islands/Lakshadweep/Daman & Diu and Dadra & Nagar Haveli Police Service, Group 'B'. (23) Pondicherry Civil Service, Group 'B'. (24) Pondicherry Police Service, Group ‘B’. 1. General Category candidates: 6 attempts. 2. Physical Handicapped Category candidates: 9 (No limit if SC/ST) attempts. 3. OBC Category candidates: 9 attempts. 4. SC / ST Category candidates: No Limit attempts. EDUCATIONAL QUALIFICATION: A passed of a Degree of any of Universities incorporated by an Act of the Central or State Legislature in India or other educational institutions established by an Act of Parliament or declared to be deemed as a University Under Section-3 of the University Grants Commission Act, 1956, or possess an equivalent qualification. Note: Candidates who have appeared at an examination the passing of which would render them educationally qualified for the Commission’s examination but have not been informed of the result as also the candidates who intend to appear at such a qualifying examination will also be eligible for admission to the Preliminary Examination. Such candidates those who are declared qualified by the Commission for taking the Civil Services (Main) Examination will be required to produce proof of passing the requisite examination along with their application for the Main Examination. AGE LIMIT: A candidate must have the age in between of 21 years and 32 years on 01-08- 2019, i.e., he must have been born not earlier than 2nd August, 1987 and not later than 1st August, 1998. AGE RELAXATION: Relaxation in age is applicable as per the Govt. 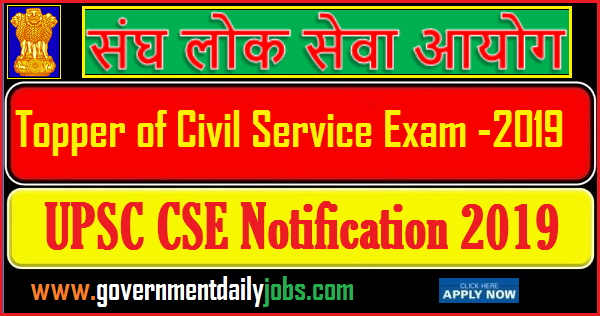 rules for SC/ ST /OBC and PH category candidates for UPSC Civil Services Prelims 2019 Notification IAS/IPS/IFS 896 Jobs. REQUIRED APPLICATION FEE: An amount of Rs. 100/- as an application fee by General & OBC category candidates to be paid either by remitting the money in any Branch of State Bank of India or by using Visa/Master/RuPay Credit/Debit Card or by using Internet Banking of SBI. Applicants who opt for "Pay by Cash" mode should print the system generated Pay-in-slip during part II registration and deposit the fee at the counter of SBI Branch on the next working day only. "Pay by Cash” mode will be deactivated at 23.59 hours of 17-03-2019 i.e. one day before the closing date; however applicants who have generated their Pay-in- Slip before it is deactivated may pay at the counter of SBI Branch during banking hours on the closing date. To opt for available online Debit/ Credit Card or Internet Banking payment mode on the closing date i.e. till 18:00 Hours of 18-03-2019. Female/SC/ST & PH category candidates are exempted from payment of fee. संघ लोक सेवा आयोग ने Indian Forest Service Exam (इंडियन फारेस्ट सर्विस एग्जाम 2019 छटनी परीक्षा) की भर्ती के लिए एक अधिसूचना जारी की है। इच्छुक उम्मीदवार यहाँ आवेदन कर सकते हैं। आवेदन करने से पहले पूर्ण अधिसूचना यहाँ पढ़ें – 90 vacant posts of Indian Forest Service (IFS) through Civil Services (Preliminary) Examination & Main 2019 through UPSC. LAST DATE TO APPLY: 18-03-2019. PHYSICAL STANDARDS: Candidates must be physically fit according to physical standards for admission to Civil Services Examination, (CSAT) 2019 as per guidelines given in Appendix-III of Rules for Examination published in the Gazette of India Extraordinary dated 19th February, 2019. POST RESERVATION: All reserved category candidates ie. SC/ST/OBC/ PWD/ Women/ Widows etc (as applicable) are being selected for said post/s as per existing Govt. policy/rules. SELECTION PROCEDURE: Candidates will be selected on the basis of performance in Preliminary Examination, Main Examination and Interview. Admit Cards: The e-Admit Card will be made available in the UPSC website [https://upsconline.nic.in] for downloading by candidates. No Admit Card will be sent by post. 1. Civil Services (Preliminary) Examination (Objective type) for the selection of candidates for the Main Examination. 2. Civil Services (Main) Examination (Written and Interview) for the selection of candidates for the various Services and posts noted above. NOTE: Applications are now invited for the Civil Services (Preliminary) Examination only. Candidates who are declared by the Commission to have qualified for admission to the Civil Services (Main) Examination will have to apply online again, in the detailed Application Form. DATE OF PRELIMINARY EXAMINATION: 02-06-2019. INQUIRY/GUIDANCE: In case of any guidance/information/clarification regarding their applications, candidature etc. candidates can contact UPSC’s Facilitation Counter near gate ‘C’ of its campus in person or over Telephone No. 011-23385271/011-23381125/011-23098543 on working days between 10.00 hrs and 17.00 hrs. SYLLABI FOR THE EXAMINATION: Candidates are advised to go through the Syllabus published in this Section for the Preliminary Examination and the Main Examination, as periodic revision of syllabus has been done in several subjects. Paper I - (200 marks) - Duration: 2 hours. 6. General issues on Environmental ecology, Bio-diversity and Climate Change - that do not require subject specialization. Paper II - (200 marks) - Duration: 2 hours. 6. Basic numeracy (numbers and their relations, orders of magnitude, etc.) (Class X level), Data interpretation (charts, graphs, tables, data sufficiency etc. — Class X level). The nature and standard of questions in the General Studies papers (Paper II to Paper V) will be such that a well-educated person will be able to answer them without any specialized study. The questions will be such as to test a candidate’s general awareness of a variety of subjects, which will have relevance for a career in Civil Services. The questions are likely to test the candidate’s basic understanding of all relevant issues, and ability to analyze, and take a view on conflicting socio-economic goals, objectives and demands. The candidates must give relevant, meaningful and succinct answers. The scope of the syllabus for optional subject papers (Paper VI and Paper VII) for the examination is broadly of the honours degree 1evel i.e. a level higher than the bachelors’ degree and lower than the masters’ degree. In the case of Engineering, Medical Science and law, the level corresponds to the bachelors’ degree. Part C: Interview Test - The candidate will be interviewed by a Board who will have before them a record of his career. • He will be asked questions on matters of general interest. The object of the interview is to assess the personal suitability of the candidate for a career in public service by a Board of competent and unbiased observers. The test is intended to judge the mental caliber of a candidate. In broad terms this is really an assessment of not only his intellectual qualities but also social traits and his interest in current affairs. Some of the qualities to be judged are mental alertness, critical powers of assimilation, clear and logical exposition, balance of judgement, variety and depth of interest, ability for social cohesion and leadership, intellectual and moral integrity. • The technique of the interview is not that of a strict cross-examination but of a natural, though directed and purposive conversation which is intended to reveal the mental qualities of the candidate. • The interview test is not intended to be a test either of the specialised or general knowledge of the candidates which has been already tested through their written papers. Candidates are expected to have taken an intelligent interest not only in their special subjects of academic study but also in the events which are happening around them both within and outside their own State or Country as well as in modern currents of thought and in new discoveries which should rouse the curiosity of well educated youth. HOW TO APPLY: For these posts (IAS Civil Services Exam 2019 Important Dates by UPSC | IAS Vacancy) eligible & willing interested candidates must apply on line at official website of UPSC http://www.upsconline.nic.in up to last date. Applicants must preserve a printout/hard copy of online application for future reference. 3. Before Apply candidate must read all instructions in the notification which available in the above table. 4. Keep the necessary details of one Photo ID Card viz. Aadhaar Card/Voter Card/PANCard /Passport/Driving Licence/Any other Photo ID Card issued by the State/Central Government while filling up the online application form. 5. Candidates will have to upload a scanned copy of the photo ID Card in the online application form. 7. Check and confirm your details before hitting the Submit button. 8. Once All details confirmed, Submit and Take the printout of your Application for future reference. CONTACT ADDRESS: Union Public Service Commission (UPSC), Dholpur House Shahjahan Road, Pandara Road, New Delhi- 110069/ Phone Number: (11) 23098591/ 23385271. CONCLUSION: Union Public Service Commission (UPSC) New Delhi invites online application for the recruitment of 896 Group “A & B” vacant posts of Indian Administrative Service (IAS), Indian Foreign Service (IFS), Indian Police Service (IPS) and other Central Services through Civil Services Examination, 2019 (CSE 2019) on regular basis from Indian residents who are eligible & interested; candidates can apply through online application. UPSC Civil Service Exam 2019 (IAS/IFS/IPS): Union Public Service Commission (UPSC) has released the Civil Services Examination (CSE) 2019 notification today. The UPSC Civil Services online application process has started today on the official website of the commission. The candidates has been given time till March 18, 2019 for the registration of the CSE 2019. UPSC has also released the Indian Forest Services examinations 2019 notification along with the CSE notification. According to the notification, UPSC preliminary exam will be conducted on June 2, 2019. UPSC Civil Examination 2019: Union Public Service Commission (UPSC) has released the notification for the UPSC Civil Services Main Examination 2019. Civil Services exam, also known as UPSC IAS 2019 or CSAT 2019, consist of the Preliminary and Main stages. The candidates needed to apply separately for both stages. The online registration for IAS 2019 Prelims can be filled up to Mar 18, 2019 till 6.00 pm. The Exam is scheduled to be conducted from Jun 02, 2019. The candidates can get the detailed information regarding the UPSC Civil Services IAS Exam 2019 from above page. LAST DATE TO APPLY: 18-03-2019 for Union Public Service Commission (UPSC) UPSC Civil Services Pre Examination 2019.